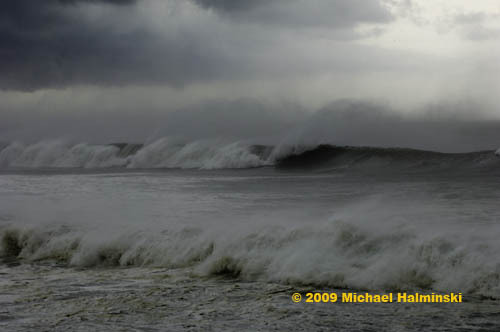 I can’t remember how many hurricanes have come and gone, since I’ve lived on the Outer Banks. It seems like dozens. Some of them have made direct impacts on us, while most others have had much less or no affect. One of the most reliable deterrents for these storms is a cold front moving across the country. 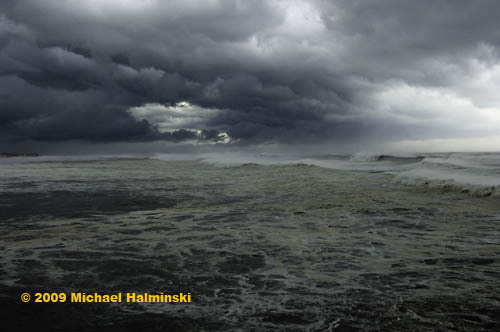 No matter how powerful they are, tropical weather systems cannot penetrate these natural barriers. Such was the case in our most recent hurricane called Bill. The timing was right to allow the storm to stay hundreds of miles offshore. Relatively large swells were predicted well in advance, and that’s exactly what we got. 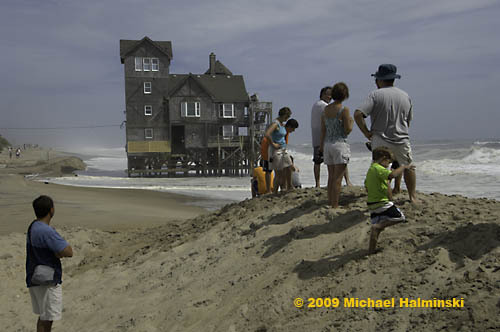 On Hatteras there was no evacuation, so visitors got a good taste of high seas, Outer Banks style. The place was crawling with sightseers and, of course surfers. Twenty years ago, I might have been included in the surfer category, but now more in my twilight, I’m resigned to being more of a sightseer when the swells are so big. 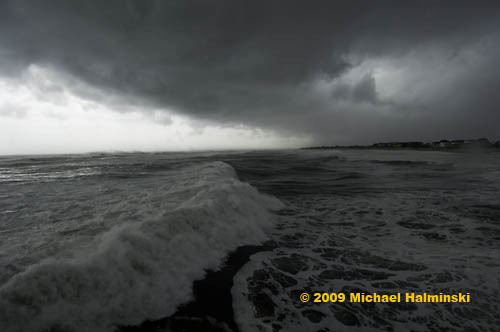 Over the years, I’ve photographed just about every storm that’s hit the island, and I still love the thrill of it. As usual, some overwash and highway closures are expected. But in this instance, it wasn’t quite as bad as it might have been. It was nonetheless, stimulating. 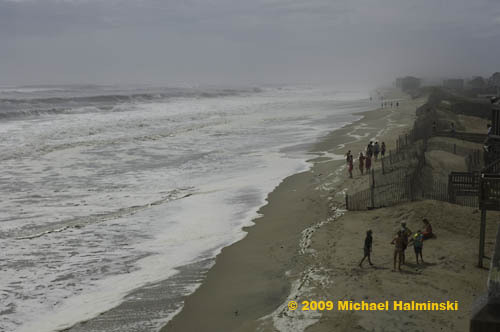 North Rodanthe is usually at the center of activity. 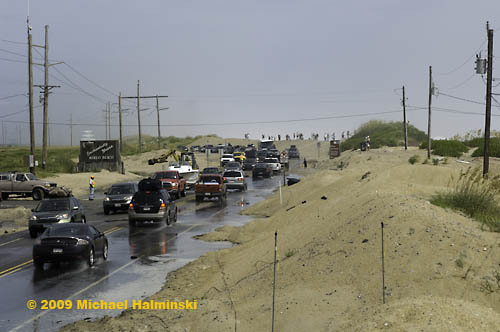 By Saturday morning the S-Curve road was wet, salty and sandy, but not enough to shut down the flow of traffic. The northernmost house at the Pea Island National Wildlife Refuge border is called “Serendipity”. It was built about 20 years ago, when there was an existing seaward dune. But this location has one of the highest erosion rates on the island… 14 to 16 feet annually. It’s really hard to believe the house is still there, although it’s been condemned because of damage, numerous times. 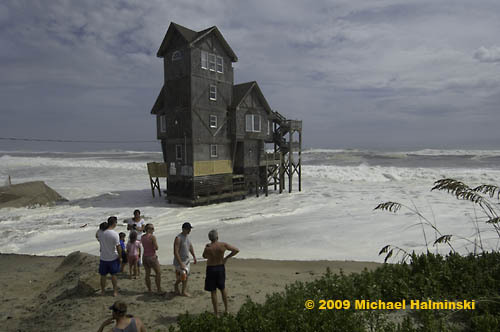 In May of 2007, it was used in the movie set of the Richard Gere chick flick, Nights in Rodanthe. Tourists and movie aficionados alike have been stopping to photograph this landmark, and this event was no exception. I’ve never seen so many people storm watching from here before… ever. 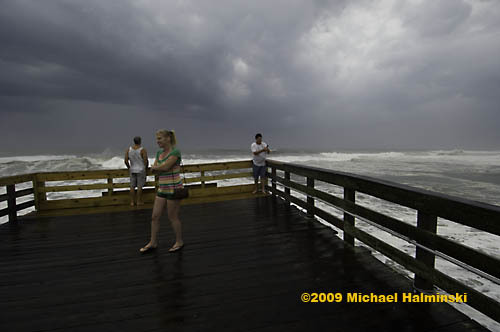 Later in the day, I waited for more favorable afternoon light and went to the Hatteras Island Fishing Pier in Rodanthe. For a buck, it’s the second best deal on the island. The first being the free ferry ride to Ocracoke, compliments of the North Carolina taxpayers. 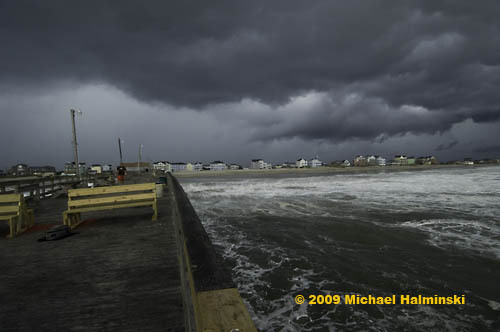 By the time I got to the pier, the predicted cold front was also arriving. Black clouds came swirling in from the west. Everyone else out on the end of the pier had gone back to shore. 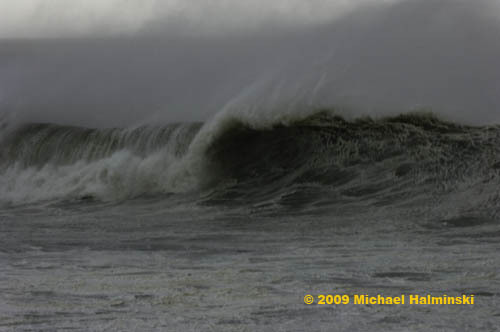 The surf continued battering the pier pilings as it rocked back and forth. How can this structure survive this kind of an environment? The answer is, it doesn’t. It constantly has to be repaired and rebuilt. As the cold front passed, the warm muggy air was replaced by cool air and the wind picked up dramatically from the west. Rain squalls came in from the south, and before I realized it, I was standing on the end of the pier in a driving rain, continuing to take pictures, and even changing over to a small telephoto lens in the process. Dripping wet, I ran back to the protection of the pier house and watched the torrent continue. In an hour it stopped, and I returned to the end of the pier with a couple of other sightseers. Would you believe this is the same pier, exactly where Richard Gere and Diane Lane filmed one of their more romantic scenes for Nights in Rodanthe? If you do, you’d be right. 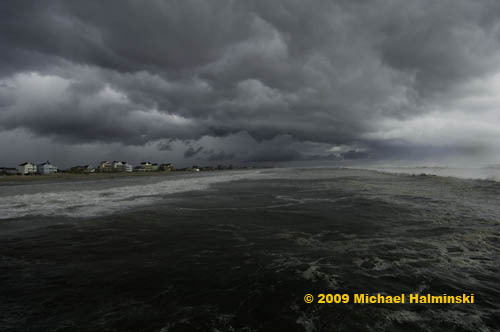 This entry was posted in beach, Sea, storms, Uncategorized, Weather on August 24, 2009 by j0jgvm89bj.